Anything's possible when people club together—just look at the UK riots as a really bad example of that. Class-action law firm Hagens Berman's seeking more plaintiffs for its lawsuit against Apple and five publishers over illegal ebook price-fixing. The publishers include HarperCollins, Hachette, Macmillan, Penguin and Simon & Schuster—five of of the top names in the book publishing world. 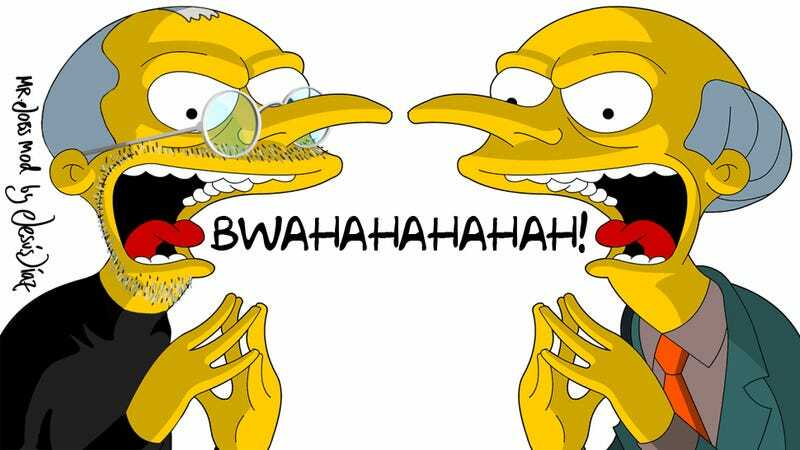 If Hagens Berman's case finds that Apple and the publishers colluded to set ebook prices at such a high level for their greedy little Mr. Burns moment, damages could be awarded to the plaintiffs, plus an injunction could see ebook prices lowered. More details are available in Hagens Berman's press release below, along with contact details at the bottom. SEATTLE — August 9, 2011 – Hagens Berman, a consumer rights class-action law firm, today announced it has filed a nationwide class-action lawsuit claiming that Apple Inc. (NASDAQ:AAPL) and five of the nation's top publishers, including HarperCollins Publishers, a subsidiary of News Corporation (NASDAQ: NWSA), Hachette Book Group, Macmillan Publishers, Penguin Group Inc., a subsidiary of Pearson PLC (NYSE: PSO) and Simon & Schuster Inc., a subsidiary of CBS (NYSE: CBS), illegally fix prices of electronic books, also known as e-books. According to the suit, publishers believed that Amazon's wildly popular Kindle e-reader device and the company's discounted pricing for e-books would increase the adoption of e-books, and feared Amazon's discounted pricing structure would permanently set consumer expectations for lower prices, even for other e-reader devices. "Fortunately for the publishers, they had a co-conspirator as terrified as they were over Amazon's popularity and pricing structure, and that was Apple," said Steve Berman, attorney representing consumers and founding partner of Hagen Berman. "We intend to prove that Apple needed a way to neutralize Amazon's Kindle before its popularity could challenge the upcoming introduction of the iPad, a device Apple intended to compete as an e-reader." The complaint claims that the five publishing houses forced Amazon to abandon its discount pricing and adhere to a new agency model, in which publishers set prices and extinguished competition so that retailers such as Amazon could no longer offer lower prices for e-books. If Amazon attempted to sell e-books below the publisher-set levels, the publishers would simply deny Amazon access to the title, the complaint details. The defendant publishers control 85 percent of the most popular fiction and non-fiction titles. Berman noted that while Amazon derived profit from the sale of its Kindle and related accessories, likely allowing the company to discount e-books, Apple was steadfast in maintaining the 70/30 revenue split it demanded with its App Store. "Apple simply did not want to enter the e-book marketplace amid the fierce competition it knew it would face from Amazon and its discounted pricing," Berman added. "So instead of finding a way to out-compete Amazon, they decided to choke off competition through this anti-consumer scheme." The complaint notes that Apple CEO Steve Jobs foreshadowed the simultaneous switch to agency pricing and the demise of discount pricing in an interview with The Wall Street Journal in early 2010. In the interview, he was asked why consumers would buy books through Apple at $14.99 while Amazon was selling the same book for $9.99. "The prices will be the same," he stated. "As a result of the pricing conspiracy, prices of e-books have exploded, jumping as much as 50 percent," Berman said. "When an e-book version of a best-seller costs close to – or even more than – its hard-copy counterpart, it doesn't take a forensic economist to see that this is evidence of market manipulation." Berman pointed out that The Kite Runner, for example, costs $12.99 as an e-book and only $8.82 as a paperback. "What is most loathsome about the behavior of Apple and the publishers is that it is stifling the power of innovation, the very thing Apple purports to champion," Berman added. "A few big-business heavyweights are taking a powerful advancement of technology that would benefit consumers and suffocating it to protect profit margins and market-share." According to the lawsuit, Apple and publishers were concerned that Amazon's $9.99 uniform pricing for bestsellers would create market pressures for other e-booksellers – including Apple – to do the same, cutting into profitability. The lawsuit goes on to claim that because no publisher could unilaterally raise prices without losing sales, they coordinated their activities, with the help of Apple, in an effort to slow the growth of Amazon's e-book market and to increase their profit margin on each e-book sold. The named plaintiffs, Anthony Petru, a resident of Oakland, California, and Marcus Mathis, a resident of Natchez, Mississippi, each purchased a least one e-book at a price above $9.99 after the adoption of the agency pricing model. The lawsuit seeks damages for the purchase of e-books, an injunction against pricing e-books with the agency model and forfeiture of the illegal profits received by the defendants as a result of their anticompetitive conduct which could total tens of millions of dollars. Hagens Berman invites potential plaintiffs to contact the office at ebooks@hbsslaw.com or by phone at 206-623-7292. You can learn more about this case by visiting www.hbsslaw.com/ebooks.